At the 2018 LA Auto Show Wednesday, updated versions of the Nissan Murano crossover SUV and Nissan Maxima sedan broke cover. The two boast evolutionary styling updates with new LED head- and running lights, revised front and rear bumpers, and new wheel designs. On both, wider availability of active safety tech follows in the footsteps—or tire tracks—of the brand’s other models. 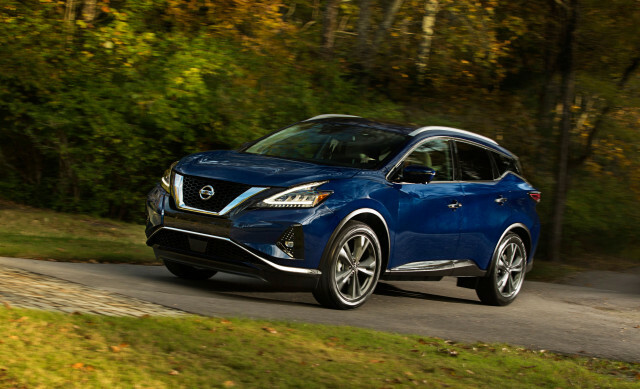 Here’s a look at what’s new for the 2019 Murano and Maxima. On the 2019 Nissan Murano, the biggest changes come inside. Semi-aniline leather upholstery is a new option for the Murano Platinum trim level. Depending on the trim level and interior color, every Murano features one of three new interior trim panels—light fake wood, dark fake wood, or a silver finish. Rear-seat side-impact airbags and a knee airbag for the driver’s seat up the airbag count in the Murano from six to nine. An 8.0-inch touchscreen for infotainment includes Apple CarPlay and Android Auto compatibility, while SL and higher trim levels now include standard navigation. All 2019 Murano crossover SUVs include automatic emergency braking, while higher-trim versions build on that with blind-spot monitors, rear cross-traffic alerts, and lane-departure warnings. What’s unchanged is under the Murano’s hood: a 3.5-liter V-6 pairs to a continuously variable transmission (CVT) with either front- or all-wheel drive. The 2019 Nissan Maxima retains its 3.5-liter V-6 engine rated at 300 hp. Newly standard LED headlights are paired with a different front bumper and grille design up front. Out back, the 2019 Maxima has quad-tip exhaust outlets and the SR trim level now includes a rear spoiler. All five Maxima trim levels have new wheels, including 19-inch wheels on the new range-topping Platinum Reserve trim. Revised upholstery patterns and a black headliner round out the major changes inside. Unlike the smaller Altima, the Maxima doesn’t offer a turbo-4 engine or all-wheel drive. Maxima Platinum and SR Premium package versions now include a full suite of active safety tech that builds on line-wide standard automatic emergency braking by adding blind-spot monitors, rear cross-traffic alerts, lane-departure warnings, rear automatic braking, and automatic high-beam headlights. Nissan did not announce pricing for either the updated Murano or Maxima. Both are slated to go on sale by the end of 2018.